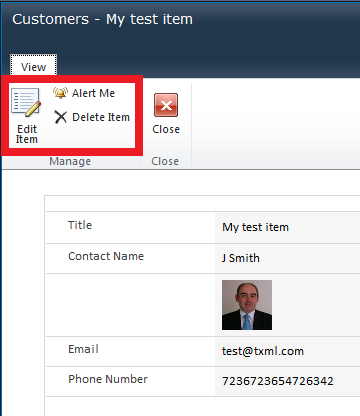 You can of course edit the form in InfoPath and add a button control. Sounds great, but there is no suitable option for the button that when clicked it will get us into Edit mode. 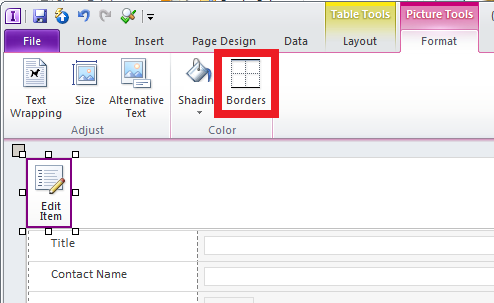 Maybe at a stretch you could create an alternative view with edit capable fields, but I fancied something simpler! It occurred to me that all my button really needed to do was take me to the edit form that already existed. The edit form had a fixed url except for the item ID, so a hyperlink with a little tweaking would be enough, I didn't need a real button at all. 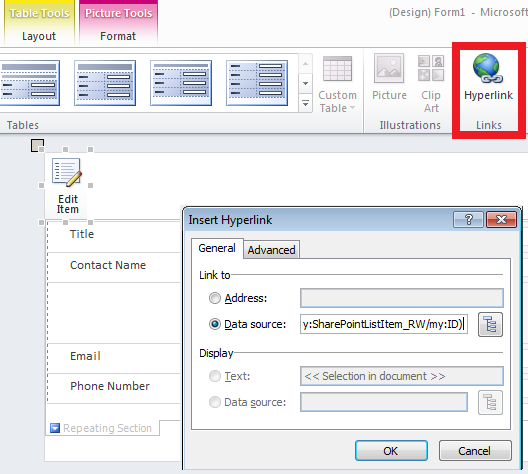 To edit an existing item the hyperlink needs to have the ID of the item specified. Instead of a plain hyperlink you can create a hyperlink like this; concat("http://YourServer/YourSite/Lists/YourList/Item/editifs.aspx?List=YourListGuid&ContentTypeId=YourContentTypeGuid&IsDlg=1&ID=", dfs:dataFields/my:SharePointListItem_RW/my:ID) where the Guids you'll provide are all from the original form url. IMPORTANT: This link needs to be pasted into the Data Source box of the hyperlink, not the Address box! (See screenshot below). [btw thanks to James O'Connor who pointed out my original fubar with this :) ]. A plain old hyperlink would look kind of odd to the users though so a little slight of hand is required to make the link look like a button. I inserted the graphic above into my form. Then selecting the graphic and inserting a hyperlink turned the graphic into an image link that looked exactly like an edit button. 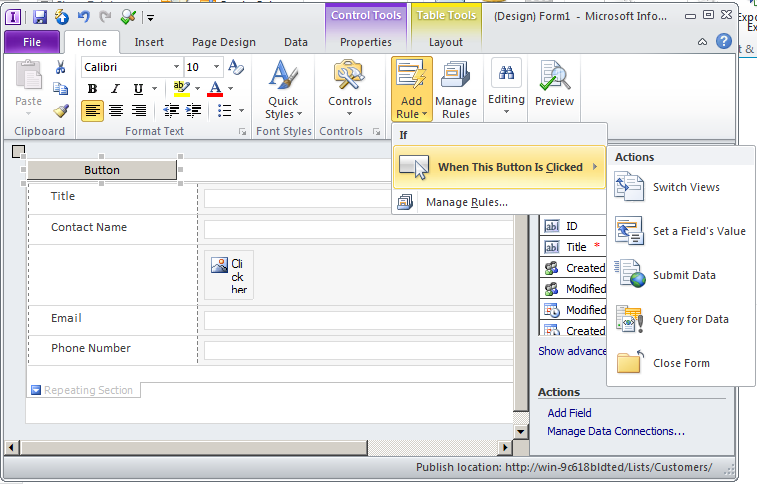 Now clicking the image that looks like a button takes you through to the edit form. Magic! The photos from this years SharePoint Evolution Conference have been posted, and I was in these so decided to post them. As stated on the photos these are copyright Combined Knowledge, not mine!